CCM ends campaign in Dar......Magufuli sharp on JK government, Reiterates promises to various groups. 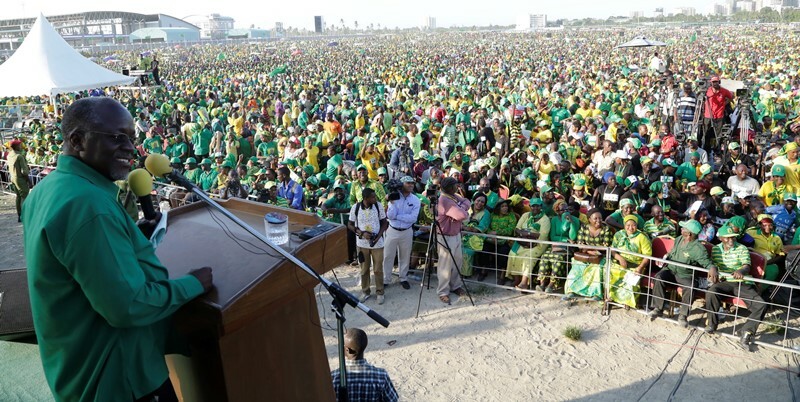 CCM presidential candidate Dr John Magufuli yesterday reiterated his seriousness in putting to effect the priorities he has been outlining in his two month campaign trail. Winding his election campaign at Jangwani grounds in Dar es Salaam, Dr Magufuli maintained his critical stance on current inefficiencies in the government, but lowered his tone in the presence of outgoing president Jakaya Kikwete. The CCM candidate said once elected he will construct passages to be used by motorcyclists and tricyclists to enable them enter city center areas in Dar es Salaam. Tricycles are prohibited from entering Dar es Salaam city center and motorcyclists have to have special permits to ply the city centre, with the candidate saying that he would ensure that the city center is open to all. He said motorcyclists and tricyclists must enjoy the freedom of doing business anywhere in the country, he said, insisting that he would form a government which is friendly to everyone. Dr Magufuli also promised to improve the welfare of workers, saying he knows well the challenges they face as he once worked as a teacher and his wife is a teacher. “ I will do everything possible to see that less paid workers are enjoying the fruits of their work , I will improve their working conditions. I know currently they pay 11% PAYE,” he said, promising to bring down that level of taxation so that workers can live more happily with the pay they get. He equally emphasized on responsibility and duty mindedness on the part of public servants, urging that they stop seeking bribes or get prepared to face the sack. “Anyone who will mess up in my government will not be transferred; his services will have stopped,” he said, insisting he will not be having friendships. He also vowed to end disturbances against women food vendors, promising to improve the areas they provide their services. He went on to cite the city water problem where he said there is an unfinished water sourcing project, also taking note that some people had filed a suit against that project in court. The case was holding up the water project and people are suffering in the cholera epidemic, he told the massive crowd. He directly attacked retired prime minister Frederick Sumaye for his vilification of the CCM record while he was prime minister for ten years in the third phase government. He combined the ten years with the two years of opposition candidate Edward Lowassa as one extended period of claims that CCM did nothing, while they were top government advisers as prime minister respectively for the period. Dr Magufuli also said he will make sure cases are speeded up in courts all over the country, underlining that as president he would not be able to interfere with the independence of the judiciary, but seek to ensure that “there are processes which necessitate speedy trials of cases of that nature,” citing the stalled water project as a case in point. He vowed to work hard to see that the there are no electricity shortages in the country, reiterating his promise that starting from next year primary schooling up to form four education will be free of charge. Dr Magufuli is today expected to finalise his campaigns in Mwanza.